Permatrend has not only solved the well-known problem of the migration of dye particles in printing ink with its innovation Textile Transfer Print Technology Perma Sport, but also secured itself a Promotional Gift Award 2018 in the category Customising Technologies in the process. The migration of the dye particles often led to discolorations especially in the case of dark softshell and polyester fabrics. This was prevented using colour blockers until now. However, since according to Permatrend blockers make the textile imprints inelastic and hard, they are unsuitable for soft, stretchy materials – the imprints could tear. The new transfer technique is based on a special dye paste that doesn’t absorb any foreign particles and thus doesn’t subsequently have to have blockers applied. According to company reports, the imprints also remain colourfast, elastic and soft after being washed 50 times. Furthermore, the imprinted textiles can be machine dried. 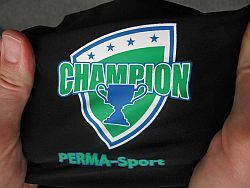 This means that Perma-Sport is ideal for difficult to print, strongly migrating, elastic material compositions, for instance in the outdoor and sportswear segment. The paste contains neither solvents nor other problematic substances such as PVC, formaldehyde or phthalate; all of the colours comply with the Oeko-Tex Standard 100 Product Class I and can be implemented for all materials – from cotton, polyester and polyamide, nylon and merino wool, through to truck canvas. There is a choice of 28 standard colours, the company mixes pantone colours itself.